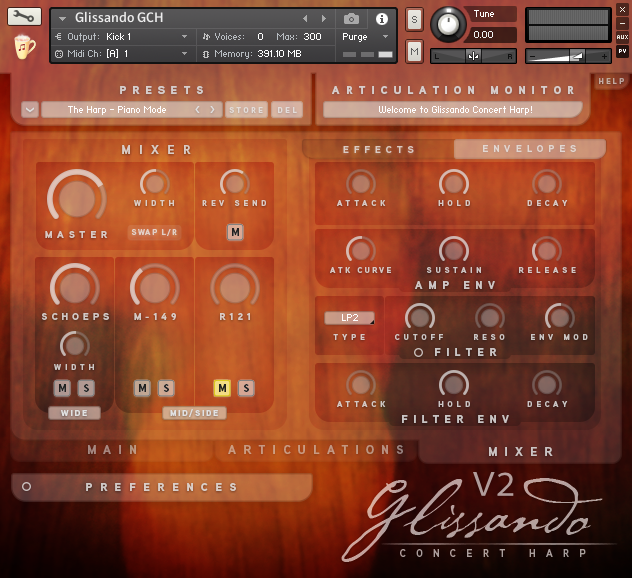 Chocolate Audio is releasing Glissando Harps for Kontakt. 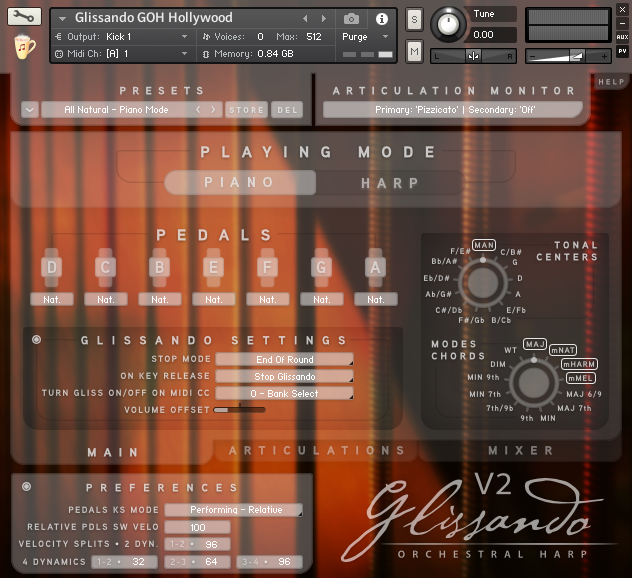 Glissando Concert Harp is being discontinued since it's now become part of this new release. Starting November 21st and running until December 23rd all products will be on sale featuring up to 65% off list price for single products and special bundles we are creating on purpose for this occasion. Harps recorded in a small room and in a large live room. 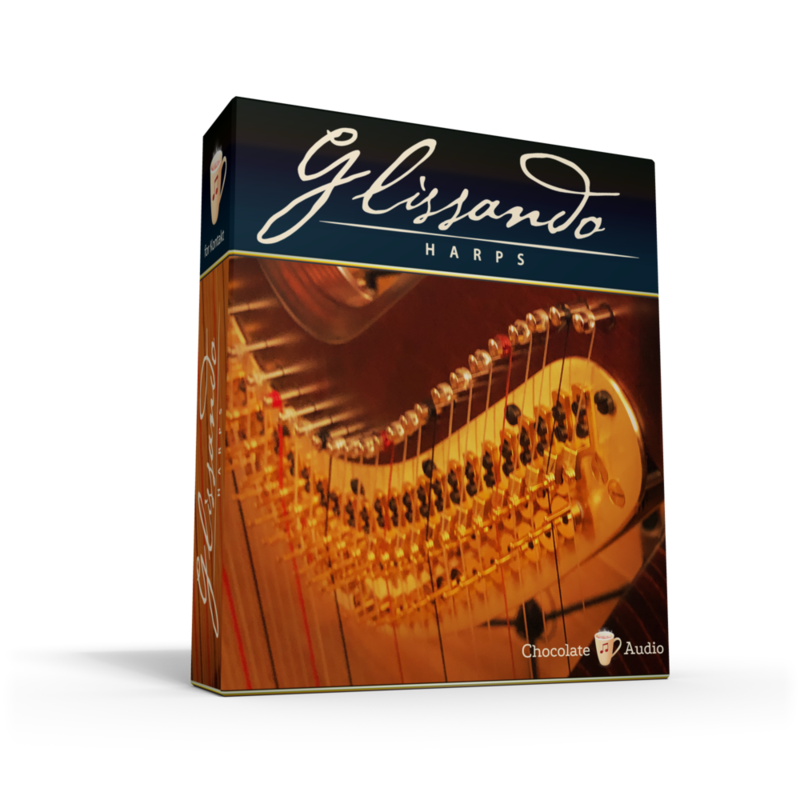 Glissando Harps list price is 169 USD. 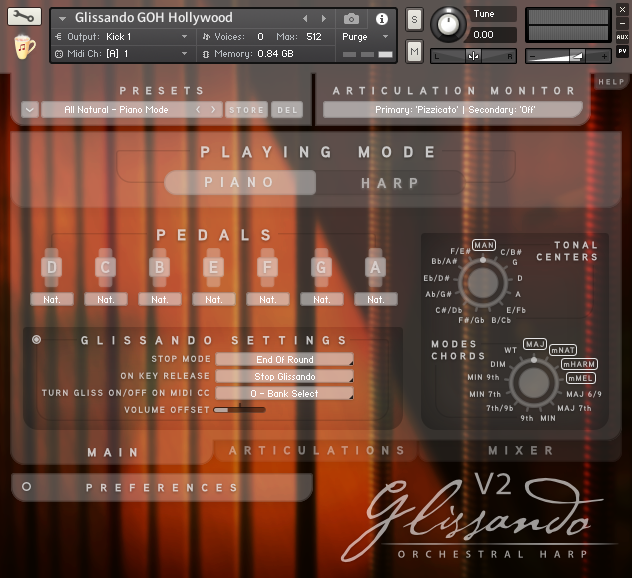 Until December 23rd, 2018 Glissando Harps is available at a special launch price of 119 USD (30% Off). 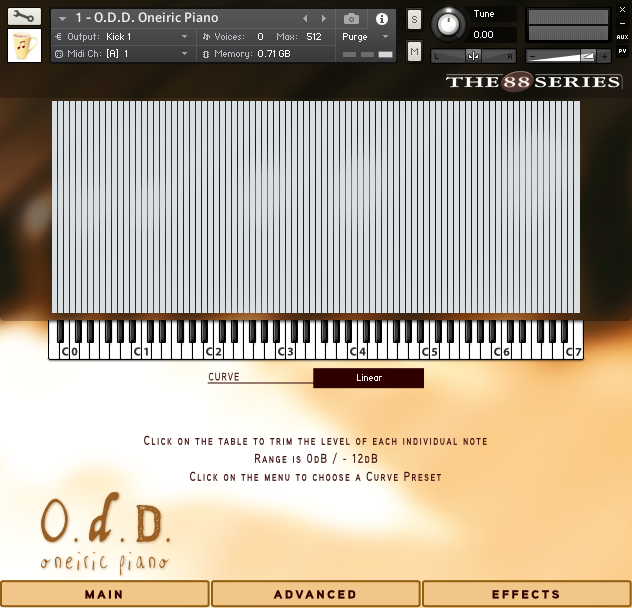 Chocolate Audio has released O.D.D Grand, their different take on the Grand Piano sound. They chose to sample the Yamaha C6 piano in Italy's Art&Music Studios with full detail (11 dynamic levels) but stop before the "ff" dynamic, in order to have a piano with a warm and intimate sound. They carefully placed no less than 29 microphones around the piano in order to achieve many different sound signatures. They chose microphones which do not represent common choices for recording "ideal pianos", but mics they found were complementing the sound they had in their minds and hearts. They compiled and edited the whole thing as a set of 3 soulful and colorful instruments. 20.56 GB (lossless compressed) library size, 20496 samples. 3 NKI Instrument Files, each representing a different take on the same piano, the result of different odd mic techniques being put to good use. 3 Sets of 4 microphones. Oneiric Piano: AKG C414B-TLII, Wunder Audio CM7 FET, AKG C460-CK1, AKG C451E-CK22. Dark Piano: AEA N22, Earthworks SR77, Beyerdynamic M88N (C), AEA N8. Dreamy Piano: AKG D190E, AKG C414B-ULS, Crown PZM30D, Sennheiser MD211. 11 Sustaining dynamic layers, chromatically sampled. 8 Release trails layers, chromatically sampled. Piano tone control, makes the piano sound softer or harder under your fingers. Many under the hood techniques to make the piano true to the original (life-like re-pedaling, release trails attenuation, intelligent attenuation of each single dynamic layer for maximum dynamic response...). 101 Custom, high quality IR reverbs (not the usual IR reverbs you find on other Kontakt libs). 71 (24 + 25 + 22) factory presets + user-saveable presets. 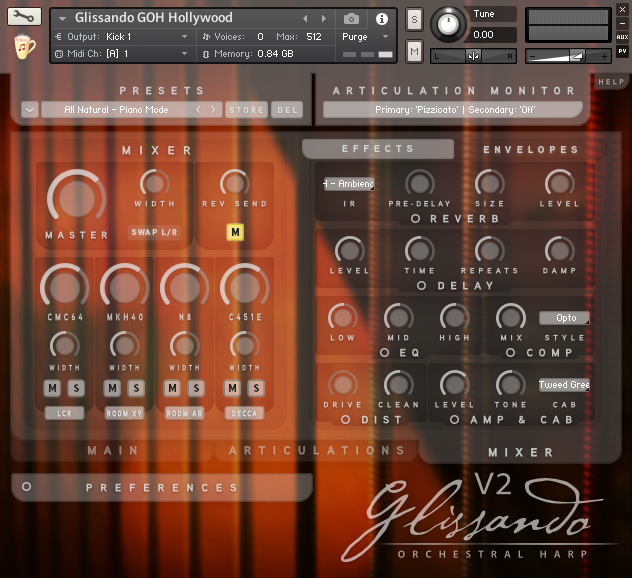 Works as stand-alone, AAX, RTAS, AU and VST for Mac and PC inside Kontakt 5.5.2 full version or better. Price: 129.00 USD and is on launch offer until March 18th for 99.00 USD. 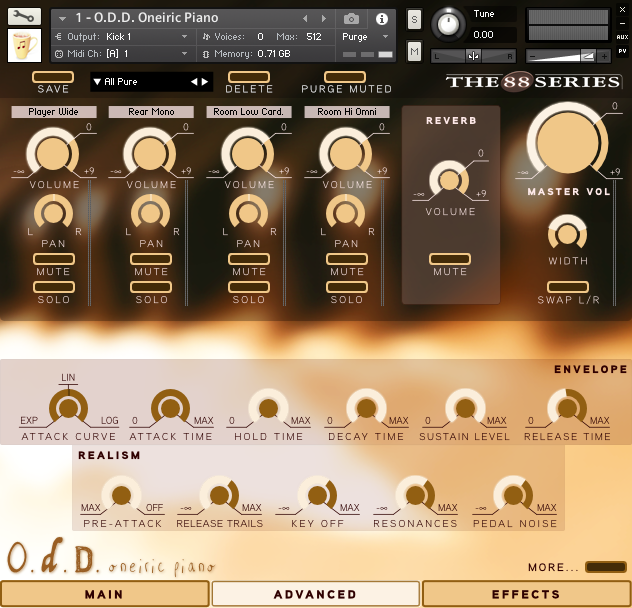 Additionally, they have updated The 88 Series Piano Bundle to v2, now including O.D.D. together with 4 of their older pianos all for 299.00 USD list. All free updates and paid upgrade paths have been made available to current users via email. Chocolate Audio is releasing two new products and an important product update in the Uproar family of heavy baritone guitar-based Kontakt instruments. 7 Collections ranging 78 to 180 BPM. 4 Parts for each Collection. each Part features up to 10 Tonal Centers. a total of 1872 Phrases. 3.14 GB uncompressed content (1.99 GB compressed). amp and DI version (so you can reamp or process it with your favorite plugins). each Part can be routed to a separate output from Kontakt to your DAW. a set of custom Impulse Responses made on purpose for this release. vers. 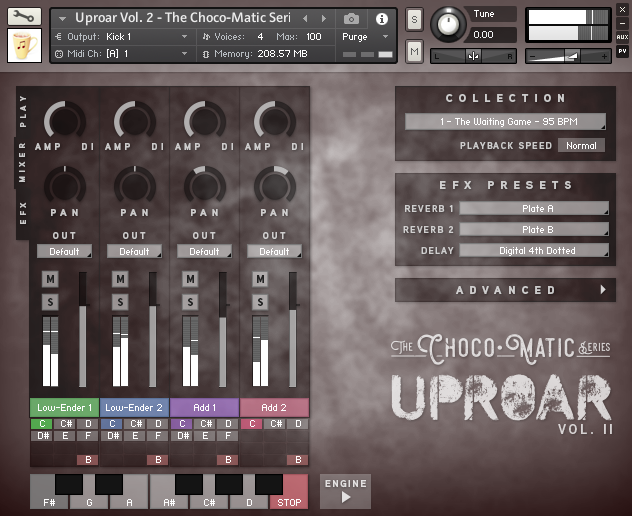 2.0 of our custom innovative Choco•Matic phrasing engine for Kontakt 5.5.2 and up (Full Version). recorded at 88.2 kHz/24-bit, released at 44.1 kHz/24-bit. requires Kontakt 5.5.2 Full Version or better. requires 2 GB of RAM and 2 GB of disk space (the more the better). Uproar Vol. 2 lists for USD 79.00 and is on introductory offer for USD 55.00 until January 31st, 2018.
requires 3 GB of RAM and 8 GB of disk space (the more the better). Uproar Bundle for Kontakt represents a saving of 50% and lists for USD 125.00.
updates both Uproar and Uproar Vol. 2.
adds the chance to Offset any Part in musical terms, both anticipating and delaying the relative loops. adds a Preview button to more easily grasp what each Collection has to offer. adds the chance to control the playback volume any number of Parts via ModWheel. adds a reset Variation on DAW-stop preference to obtain more predictable results when integrating the engine in a DAW environment. the v. 2.0 version of Uproar (vol. 1) will be sent via email soon to registered users. if you already own 1 or 2 products from the Uproar line, please contact us through Support for a personalized quote to upgrade to the Uproar Bundle. Chocolate Audio is pleased to announce the release of Drum Singles Collection for Kontakt, a compilation of no less than 149 drums. 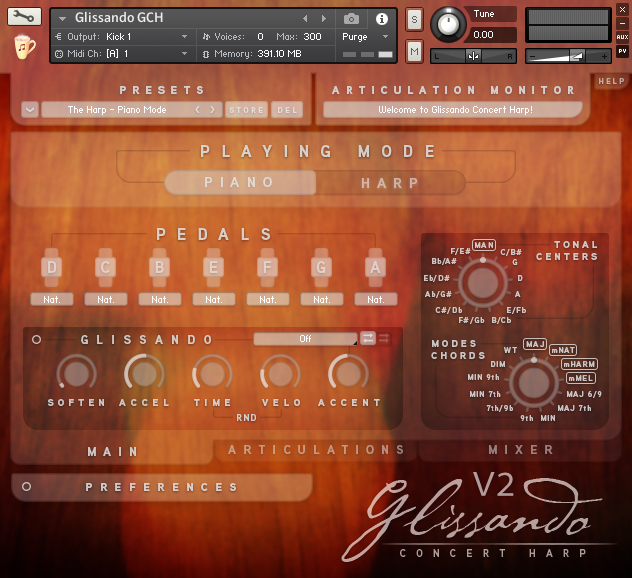 Chocolate Audio is releasing Glissando Concert Harp for Kontakt. 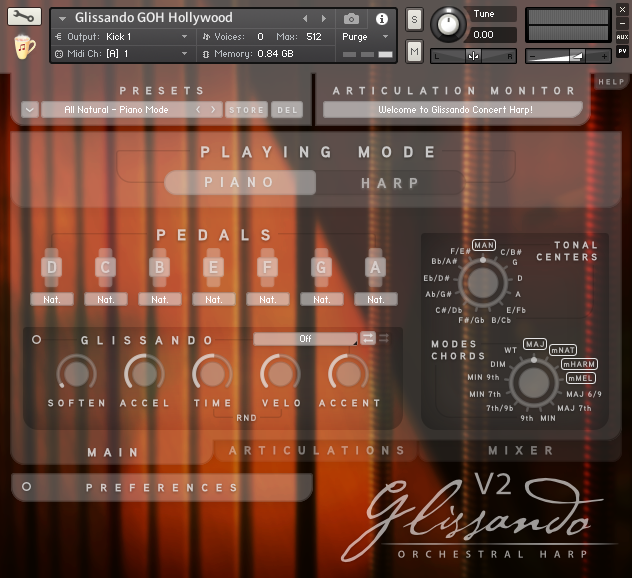 A 47-strings concert pedal harp made by Camac and sampled in full detail. 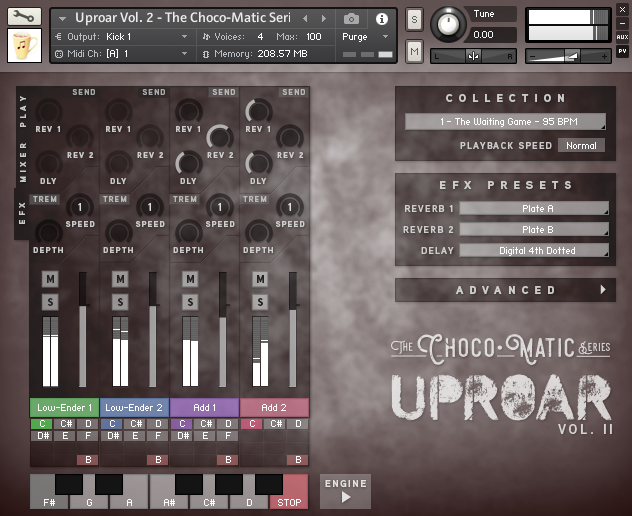 Uproar marks the first release in The Choco•Matic Series, an innovative custom phrasing engine for Kontakt 5.5.2 and up. Uproar features the sound of an 8-string baritone guitar. A new drum product with 2 kits that helped define the sound of the 90s. Starting now and ending on December 10th, we're offering a 30% off discount on any product or bundle. If you have been late for Black Friday and Cyber Monday, this is your last chance to get our products at amazing prices before the end of the year. We're offering 50% off the Everything Bundle (all instruments released so far). You can own our hi quality instruments: 4 pianos, 1 bass and 1 drumkits instruments for Kontakt (FULL VERSION) and BFD (the drums) for 332 USD instead of 664 USD. This is 55 USD for each library! Hurry up, the offer lasts only through Nov. 30th, 2015! If you are subscribed to our newsletter or have purchased from us in the past, look into your email or just re-add yourself to our database and we'll send you an even better offer in the coming hours!!! Contemporary Vintage drums for BFD & Kontakt is still on offer, 30% off until Nov. 30th. Chocolate Audio has announced the release of Contemporary Vintage Drums (BFD & Kontakt) with a special 30% off launch offer. Chocolate Audio has announced the release of the BBassV Electric Bass for Kontakt with a special 35% off launch offer. Relax and take a listen!